melt and filter it to another wide pan. cardamom powder and ghee. Switch off the stove and add puffed rice. Mix well and make lemon size balls with wet hand. 3. 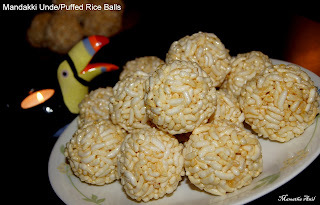 Mandakki/puffed rice balls are ready.